Edward was born in 1896 and lived with his parents Bernard (a broach maker) and Mary and siblings Robert, William, Alfred, Elizabeth and Peter who also went to war. The family lived at 4, Halls Cottages, The Holt. He came from a family of broach makers but Edward was an apprentice shoe maker at the time of the 1911 Census; however by the time he enlisted his profession was given as a miner. Records show that in May 1915 he suffered gunshot wounds to his shoulder and then later in July 1916 he was sent back to England suffering from shell shock. Despite treatment, his condition did not improve and he was discharged “not fit for service“ in July 1917. 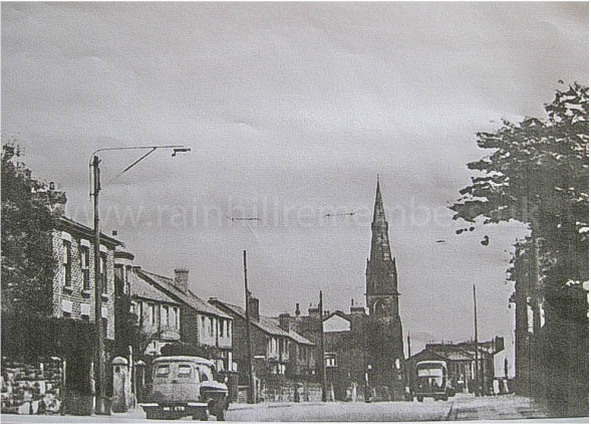 This photograph was taken looking towards Rainhill and Hall's Cottages , where Edward lived are immediately on the left beyond the Church.